Another grand jury somehow manages to avoid indicting a cop who put an unarmed man in an illegal chokehold and, ignoring his pleas (“I can’t breathe!”), strangled him to death. Eric Garner’s crime was peddling untaxed cigarettes on the sidewalk. He was a husband and the father of six. And he was a black man. I hope I may be forgiven for believing that last fact to be germane, both to the confrontation in which he died and the fact that his (white) killer, Officer Daniel Pantaleo, now escapes any scrutiny of law. Another district attorney somehow managed to avoid gaining an indictment within a grand jury process he entirely controlled. It is said that any competent prosecutor can get a grand jury to indict a ham sandwich, if that’s what’s desired on the day. I hope I may be forgiven for believing that Staten Island DA Daniel M. Donovan Jr. had no intention of putting a cop on trial. Never mind that Officer Pantaleo was captured on video tape performing an illegal act that led to the death of a human being who’s threat to society consisted of dodging local tobacco taxes, cancer stick by stick. I got nothing. This is not a justice system. This is not policing in any form that I understand. This is how law serves as cover for power when the forms but not the substance of civil society are all that is left. I got nothing at all. 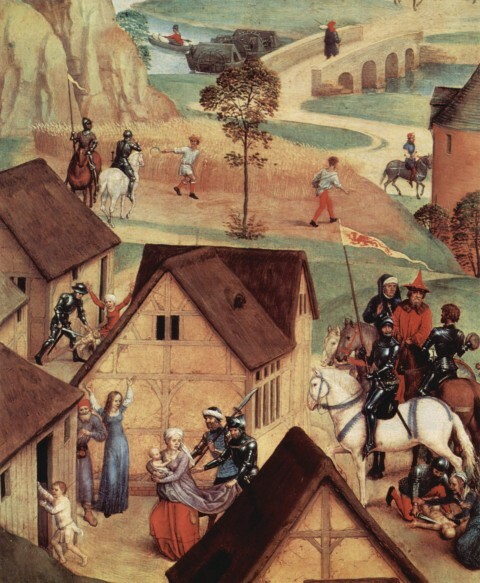 Image: Hans Memling, Massacre of the Innocents at Bethlehem, (detail), 1480.